Just in time, beginning October 99, I was lucky enough to have one of the first 600mm lenses with the new picture stabilizer delivered to me. Two weeks later, I had a flight to Canada with a colleague of mine, to spend four and half weeks there. 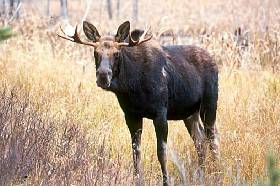 The first two weeks in the Riding Mountain National Park, with emphasis on Beaver, Moose and Timber Bison. Then, the last 2 weeks in Churchill for photographing Polar Bears and if possible, some Snowy Hares, Ptarmigans and Red Fox. It is easy if you can plan almost everything absolute exactly before setting out on your tour, except for the weather of course, and that did not cooperate at all in the first few days. Fujichrome Sensia 100, AP 4,0 and 1/30 sec. From the street we saw about 20 Beaver dams in the Riding Mountain National Park. But we needed a few days to find a dam where the Beaver was still somewhat active during daylight. Unfortunately the dam was about 25 m in distance from the shore and our jeep had to take the place of the camouflage tent. Here is where the 600mm lens with stabilizer was invincible. 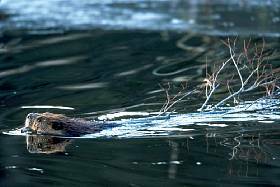 At daybreak, during the very first rays of sun, I was able to make snappy clear pictures of swimming Beavers with loose twigs in the mouths. The adjustments from the car disc tripod and the 1,4 converter equivalent to the 840 mm and exposure times of somewhere between 1/30 and 1/60 sec. with activated stabilizer enabled me to take extremely clear pictures. The auto focus with a converter added worked great. I took all photos in the operating modus 2 of the stabilizer, with which vibrations of the range finder are suppressed, so that I was able to follow the swimming Beaver without problems. My colleague with the old EF 4,5/500mm L was at a loss in these situations. I was able to archive a total of 160 sharp photographs, my colleague only 10% of that! Especially when you have two photographers shooting out of the same car, it is difficult to keep the car still. The slightest move, a change of film or lens, can be the cause of blurred pictures with these exposure times. Another great advantage of the stabilizer. Fujichrome Sensia 100, AP 5,6 and 1/60 sec. A few days later, almost the same situation. We were able to shoot a Muskrat in a water ditch from the parked car for quite some time. (see picture). With the 600mm lens plus 1,4 converter and 840mm I was able to get the Muskrat in a clear stature. My colleague had some problems. 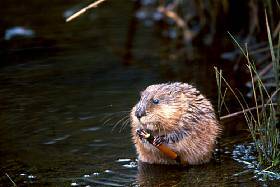 The 500mm was too small for an illustration standard and with the 1,4 X converter at 700mm focal length the exposure times were so long, that he was able to take only very few clear pictures, even though the Muskrat was completely still in position. From a parking place I shot a Pine Jay Bird. First with 840mm, shortly thereafter with the 600mm plus stabilizer. Then I realized that the bird was´nt as shy as I thought and approached him with the 100-400mm L IS USM. He allowed me to come up to one meter. This way I was able to take some portrait pictures of a Pine Jay. After two weeks we flew from Winnipeg to Churchill. At the airport we met my colleague Konrad Wothe, as planned. The weather in Churchill was just as cloudy and mixed with hardly any snow in the first few days. During the first week we wanted to drive around on the back streets and roads with our rental car to look for Red Fox, Snowy Hares and Ptarmigans. In order to photograph from the side windows of the car more efficiently, we had to fill the empty bean sacks we brought with us. The three of us went to a supermarket and bought all of the beans in the shelf. After that we put some kilos of rice into our shopping cart to take with us. The saleslady at the cash register was speechless and just shook her head. 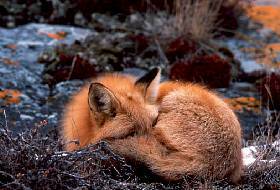 On the second day, I was able to shoot a sleeping Red Fox, first from the car and then from the tripod with the 600m L IS USM at an aperture of 4,0 and 1/30 sec. under a cloudy sky. He met up with us several times in the course of the following days, unfortunately the sun was missing and I was happy to at least take a few pictures with the 600mm plus stabilizer from the car window tripod. There I used a shutter speed of up to 1/20 sec. Unthinkable without stabilizer. A great help are the 4 easy to grasp AF stop buttons on the front ring of the lens. In connection with the Custom Function 19 (CF19) on the EOS-3 they allow for a speedy switch from One Shot to AI Power, or back. My colleague with the old 4,5/500mm L had no chance at all in this situation. Fujichrome Sensia 100, AP 5,6 and 1/30 sec. 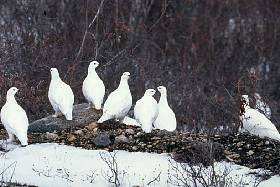 The stabilizer helped me extremely while photographing the Ptarmigans from the car. In this situation I found that the AF gripped a lot better and clearer than the predecessor with motifs of less contrast. It was a large group and I had to really fade out in order to get better sharpness in the depth. In the end I reached 1/60 sec at an aperture of 11. After several days, the sun came out and we found two wonderful Snowy Hares in best light. From a safe distance I again used the 600mm lens. I crept up to the Rabbit far enough so that I could use the 100.400 mm IS USM lens. Lying on my stomach and again free-handed and with the stabilizer I was able to take some wonderful pictures, partially even with back light. In order to photograph the Polar Bears of the Tundra, we had rented a Tundra Buggy incl. driver for 5 days. Since the cost of such a special vehicle is rather high (800 Canadian Dollars a day) we split the cost and took another photographer with us. The five of us (incl. driver) in the buggy again confronted us with problems. The vehicle was never completely still. One or the other always had to change a roll of film or a lens, changed his position, or searched for one thing or another in his back pack. Konrad Wothe and I had the joker ---- the stabilizer. Konrad used the 4,0/500mm L IS USM, the 2,8/300mm L IS USM and the 4,5-5,6/100-400mm L IS USM lens. We congratulated ourselves numerous times during the day for having these great lenses. We even used the stabilizer lenses at times when the buggy had just come to a halt and the engine was still running in order to shoot a great situation at that moment. We were in the opinion that the stabilizer used less power than expected so we jokingly compared it with the hum of a dynamo that usually produces power. During the almost 4 weeks, I did´nt once turn the stabilizer on the 600mm lens off. The power consumption is low in my opinion. An example: I worked with three lenses alternately for three days. With the 600 mm L IS USM, the 100-400 mm L IS USM and the old 2,8/300 mm lens, about 20-25 rolls of film a day with an average of 5 - 10 degrees below freezing, exposed with three EOS-3 casings, added booster and the Canon battery packs. It took three days for the battery packs to be empty. In other words, I shot 20-25 rolls of film with only one single loaded battery pack. That is a very good result. The advantages over the predecessor are: weatherproof seal on all buttons and switches on the lens. An improved lighter aperture made out of carbon and a reduction of weight of at least 800 grams. For photographers who frequently shoot small birds the new distance meter for close ups of 5.5 meters is certainly interesting. The sights in the lenses are completely recalculated and guarantee an absolute top performance! The price is also a top performance of about DM 22.000.